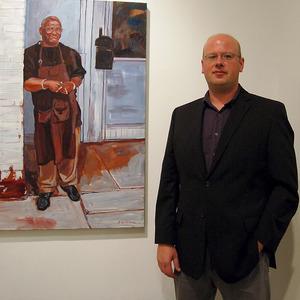 BIO: Andrew Barthelmes was born in Peekskill, NY in 1974. He received his BFA from the School of Visual Arts in 1996. After graduating he continued to live in various New York City neighborhoods. He became captivated by the relationship between people and the urban landscape, and this continues to be the main focus of his paintings. In 2002 he returned to Peekskill, where he lives and works. He has been in several group and solo shows in the New York area. STATEMENT: Our relationship to the urban landscape fascinates me on many levels. One aspect is the isolation of the human condition against the backdrop of the city. Every building tells a story through its condition. Like people, there is a cycle within cities: reinvention, building, and rebuilding. It is the intersection of these themes that I try to capture in my paintings.